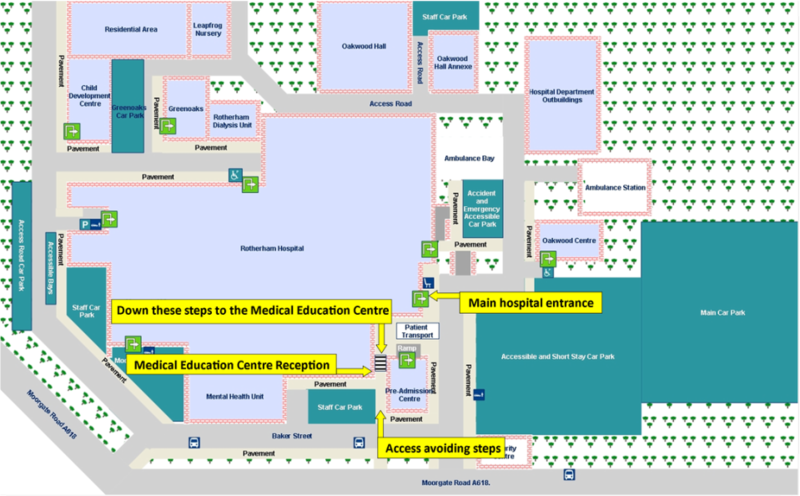 Directions to Rotherham Hospital, to the Medical Education Department and site plans for the hospital and the hospital site. 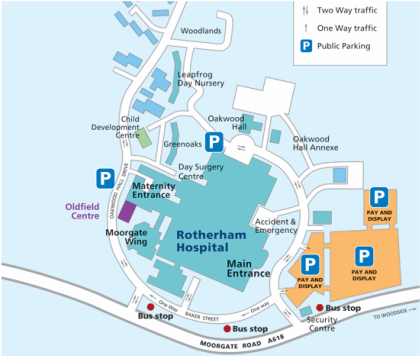 The Trust's website provides general information on finding Rotherham Hospital. public transport and car parking on site. See also the Trust's route planner, site photos and accessibility information . We recommend that you access the Medical Education Centre via its own entrance and reception, which is close to the main hospital entrance. Do not go into the main hospital entrance but instead walk past the main hospital entrance heading downhill and follow the pavement round towards the drop-off area/taxi pick up point. You'll see the Pre-Admissions Unit ahead of you, with distinctive red hand rails. Go down one flight of steps under the Pre-Admissions Unit footbridge. The entrance to the Medical Education Centre is immediately on your right. The route is marked by the yellow arrows on the map below. See also the full hospital site plans. Yellow arrows mark the route to the Medical Education Department. Click on the map for interactive site photos. View map on a mobile. The Medical Education Centre is on Level D of the hospital. Walk to Junction 1 and go downstairs to D Level. Follow the signs from there to the Medical Education Centre. Floor Plan of Level D.
To help you navigate around the hospital site and within the hospital itself please see the Trust's site map and floor plans. For interactive maps, images of key locations and advice on accessible routes please see Trust's route planner, site photos and accessibility information .